Tarawera Falls were created when Mt Tarawera erupted just over 130 years ago and it has an impressive 65 meter high rock face surrounded by native bush. The easy walk takes approximately 40 minutes return, this leads you to the lookout where you can view the base of the waterfall. We promise it really is as spectacular as the photos, if not better! The road to Tarawera Falls is private, head into the Kawerau Information Centre on the way to get your vehicle permit (only $5). 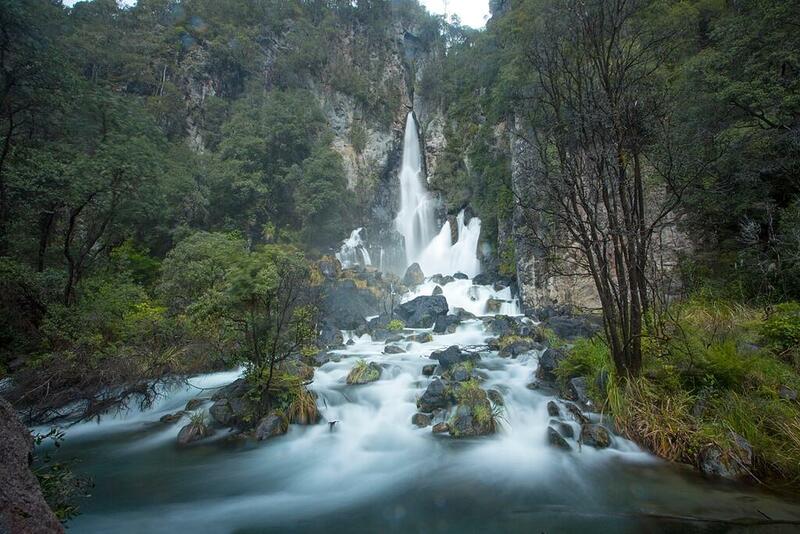 McLaren Falls is located on Mangakarengorengo River, 1 hours drive from Rotorua. After a downpour the cascades look absolutely unbelievable and wet days are most definitely the best time to view the falls. Stay in your car and view the waterfall from one of the few car parks on the bridge. Alternatively you can enjoy an easy short walk on the waterfall track to view the picture perfect falls, the track is also a great spot to check out glow worms twinkling above your heads if you go at dusk! Summer time means swimming and the best place for this is at waterfalls! At Kaiate Falls there is an awesome swimming spot where you can jump off the side of a waterfall and play around in the waterhole. 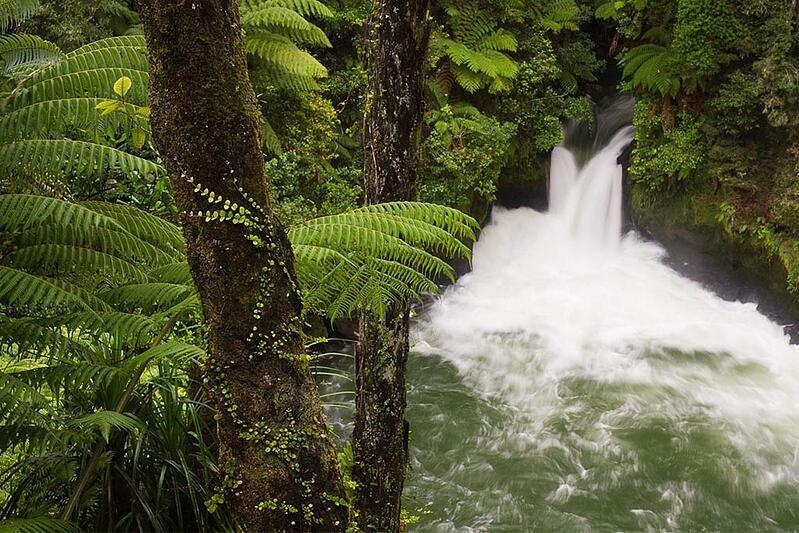 Kaiate falls is an easy 1-hour drive from central Rotorua. Once you arrive at the parking lot there is a 15-minute walk to get to the bottom of the falls, or you can follow it to the top before heading down, and see the upper series of falls. Kaiate Falls will definitely be up there as one of New Zealanders favourite places to swim - if the locals love it then so will you! Watching this waterfall can make for a highly entertaining afternoon, you can watch the rafters and kayakers plummet over the 7 meter waterfall – Tutea Falls is the worlds highest commercially rafted waterfall! 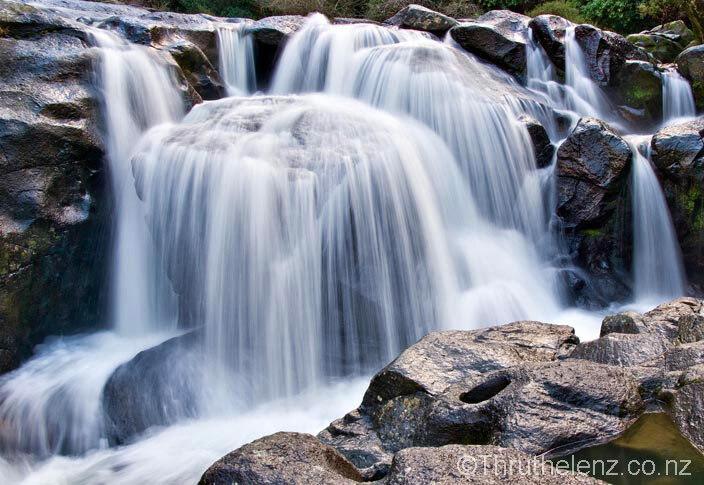 An easy 30 minute walk one way will take you from the official parking area at the beginning of Okere Falls Road, following along Kaituna River, passing by Okere falls, Tutea falls and Kaituna falls where the walk finishes up at the end of Trout Pool Road. Return via the same track back to the car park. If it's a cold day grab a takeaway hot drink from the Okere Falls store to help warm you up. Want to raft the Tutea Falls? Check out our Raft & Zip Combo! Photo: Tutea Falls is the best place to watch raft boats come over the 7 meter high waterfall - one of our favourite free things to do in Rotorua.